Following yesterday’s attack on the village of Madama by Israeli soldiers and settlers, Huda Ibraheem Nassar, the mother of the family who were violently attacked yesterday, recounted to us the harrowing story of what happened. Currently one of her sons who was seized by settlers in what yesterday was thought to be a kidnap is now being held in the Huwwara Military Camp, while the other is recovering from gunshot wounds in his leg. Huda herself and two of her daughters were beaten by Israeli soldiers during the attack on Monday. Huda told us how two of her sons, were grazing their sheep in the valley next to their village, in a spot distant from the illegal Israeli settlement of Yitzhar. One of her sons Mahmoud went to bring a donkey back from the village, Mamun her other son spotted a settler notorious for various attacks on villages around the Yitzhar settlements. He called his brother Mahmoud to return back to the valley, fearing that he was going to be attacked. In fact, when Mahmoud returned he found Mamun handcuffed whilst being horrifically beaten by a settler. Two Israeli soldiers stood back and watched the attack, while many other soldiers surveyed the area. Mamun was being severely beaten and strangled by the settler, his face was swollen and full of blood and he was foaming from the mouth. Seeing this, Mahmoud went to try to free his brother, but was stopped by the soldiers who started beating him on his head with the butts of their guns. Huda and two of her daughters, together with her other son, Amir, arrived on the the scene and went to attempt to help their two brothers, only to be also beaten up by the soldiers. At that point the soldiers started shooting live bullets at the family. One shot passed just next to them, while another one hit Amir in his leg. “They wanted to kill Amir. I heard the officer giving that order. He was just lucky that the shot hit his leg,” Huda told us. As more villagers arrived at the violent scene, Amir was taken away back to the village. Mamun who was severely beaten was then taken away by the Israeli soldiers. “I am really worried about Mamun. He was in a really bad shape, full of blood and his face was swollen. I hope they gave him the medical attention he needed”, his mother Huda said. The District Coordination Office informed the family that Mamun is currently being held at the Huwwara Military Camp. 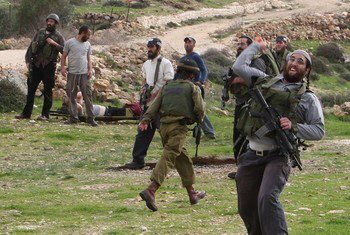 During yesterday’s attack two other people where injured when soldiers and settlers attacked the villagers that arrived at the scene of the aggression. One was hospitalised with gunshot wounds in his leg, while the other was hit on the side of the head with a tear gas cannister. I emphasize, just some examples…. Still live in fairytaleland about Israel? Time to wake up: The Map of the “Greater Israel” even is hammered on their currency.